Late Summer and Fall 2015 provides an opportunity to expand your artistic horizons. Delphi's Creativity Center in Lansing, MI presents new techniques introduced by Guest Instructors on the cutting edge of art glass innovation. This season renowned glass artists Wesley Wong, Margaret Zinser and Tim Drier impart their innovative new ideas and techniques to student glassworkers at Delphi. Get to know each artist and their work, then see which class is right for you! Class sizes are limited so register now to ensure your opportunity to work with these amazing artists. 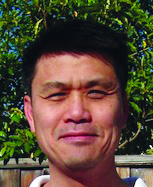 Wesley Wong is an award-winning artist who designs and produces custom glass art from his studio in San Jose, California. 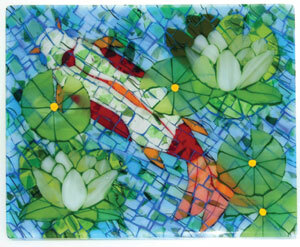 His passion for glass started in 1981 with stained glass, which eventually lead him into mosaics and fused glass. His work features lots of bright colors and intricate patterns and has been exhibited in many juried glass and mosaic shows throughout the United States. Receive a 10% discount on any 2 of Wesleys September classes. Receive a 20% discount on all 3 of Wesleys September classes. Please call Delphi Creativity Center to sign up and receive the discounts. Check out Wesley's work on his blog or our Pinterest board. 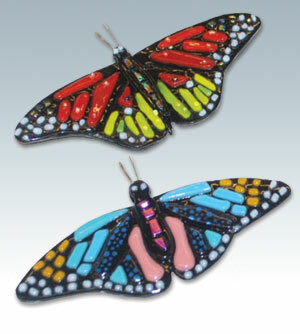 Create a 7 fused glass Monarch butterfly that can be incorporated into a mosaic project or mounted for display. Techniques will be covered for adding wire for the antennae, angling the wings to appear like it is flying, and how to scale down the butterflies for ornaments. 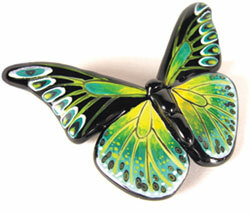 Students will learn how to attach hardware for mounting the butterfly for wall display or as a garden stake. Students will also have the opportunity to make a pendant-sized ladybug or bee as time permits. 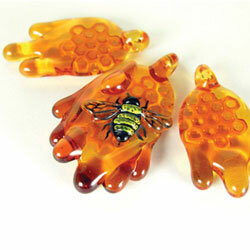 The fused glass Monarchs were featured in the Summer 2013 issue of Glass Patterns Quarterly magazine. Skill Level: Intermediate, basic glass cutting skills required. Want to add dimension and texture to your fused glass pieces or fused elements for mosaics? This hands-on class will teach you techniques for adding texture and movement for 3-dimensional effects through the use of various fused glass materials, glass paints, and fiber paper. 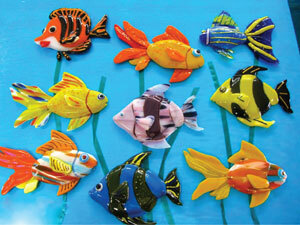 Students will make a large 7 fish that can be incorporated into a mosaic piece or as a standalone piece. Techniques for adding a wire loop for wall display, and resizing and reorienting the pattern will be covered. Students will also make a 4x4 fused tile that can be rigged for hanging. This class combines the techniques of mosaics with fused glass to produce a unique work of art. Students will be provided with a variety of patterns to choose from and shown several ways to cut glass into small tesserae or glass tiles. We will cover the andamento or visualflow and placement of the tesserae to complement your design. Students will create a 6x6 fused mosaicthat can be used as a glass tile or incorporated into a larger project.We will also demonstrate how to expand on this technique to producea double-sided fused glass mosaic with lots of depth. Skill Level: All skill levels, basic glass cutting skills recommended. 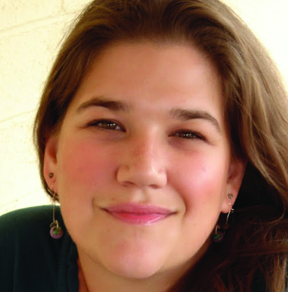 Margaret began flameworking in 2001 while working as a lab scientist, preparing for graduate work in Entomology. She loved the technical challengeof working with a molten medium. Fameworking appealed to her scientific side and provided an outlet from exacting lab work. Explore Margaret's work on her website or our Pinterest board. Margaret will show her strategies for sculpting nature-inspired beads and pendants out of soft glass in this 1-day workshop. Many insect-themes will be covered, but if bugs arent your thing, Margaret will help you adapt the relief sculpting techniques she uses to your own repertoire and artistic content. Work both on and off mandrel, using sculpting and flameworking techniques to create neat details on flameworked jewelry! Leaves and other foliage, caterpillars, butterflies, ladybugs, and so many more fun designs will be included. For intermediate (or advanced) beadmakers. Materials and use of tools included. This this fast paced and FUN workshop is for intermediate (or advanced) beadmakers. Learn to add another dimension of detail to your work. Discover the essentials for adding surface detail with vitreous enamel paints, learn safe handling of glass powders and enamels. Leave class understanding how to properly mix enamel for various applications; how to apply enamel paint to beads; how to correct mistakes and how to fire finished pieces. Learn Margarets techniques for sculpting shaping tools to create detailed beads and pendants. If bugs arent content that interests you, Margaret will help you translate your own designs using techniques covered in class. Techniques for sculpting, painting, and firing work made without a mandrel (AKA the beadmakers security blanket) will also be included in class. Tim Drier has been a glassblower for 25 years, and applies his scientific glassblowing expertise to artistic flameworking. He concentrates on creating decanters, goblets, vases, and human sculptural forms. Drier has taught flameworking courses at The Studio and the Pittsburgh Glass Center, and has demonstrated at the International Flameworkers Conference at Salem Community College. 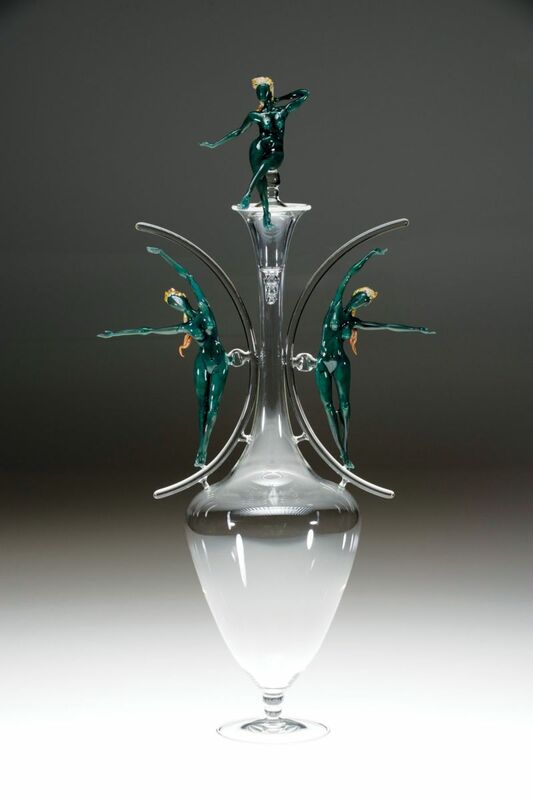 Check out Tim's work on his Corning Museum of Glass page or his Pinterest board. Tims two day course offers a fun stress free and creative range of flameworking techniques for the beginner as well as for the intermediate flameworking artist. Using borosilicate glass, students will be taught to make and create a variety of small solid sculptural forms, with the focus on moving into the exciting and unlimited options that hollow tubing can offer. Students will learn to use a blow hose and create small hollow vessels, beads, and small goblets. Topics including using and adding color for detail and sandblasting for depth and interest will also be a part of this awesome class. 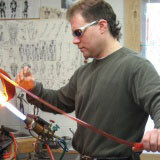 Some previous experience with torches and borosilicate is recommended but not required for this flameworking class.